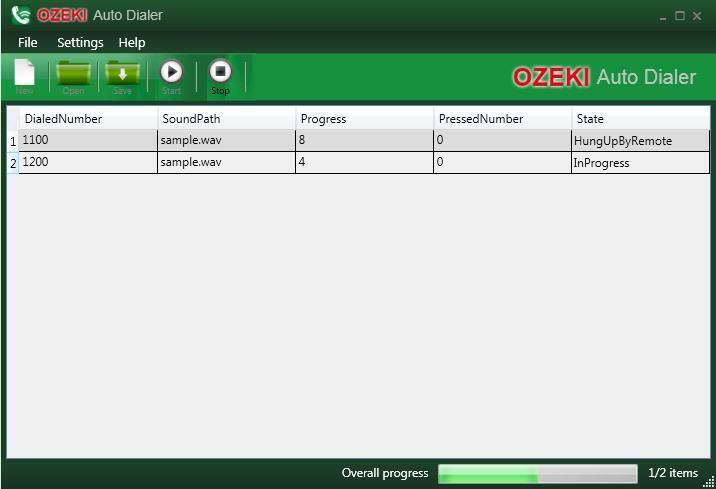 Ozeki Broadcast By Phone is a Windows-based auto-dialer software that uses your computer to deliver automated voice messages in your own voice. In addition, it provides live-call transfer, touch-tone opt-out and date/time adjustment options integrated into a chrystal-clear interface. This is an example project for the Ozeki Phone System XE. It comes with a fully functional installer that will install the ready to use application to your Windows PC. You may also download and modify the source code and distribute the modified version freely. Due to the VoIP technology the Ozeki Broadcast by Phone can initiate calls through your computer. It means that the calls can take place either through a VOIP channel (i.e. SIP) or through your PSTN lines. For this purpose you can record your speech by using your computer or telephone. Click on 'Start' button to make a call now, or click on the 'Settings' button and specify the date and time when you want the messages to be sent. This way, your call can be scheduled for later. Advanced functionalites make Ozeki Broadcast By Phone a useful and widely applicable business software that provides great opportunites for profit-oriented companies, non-profit organisations, politicians and schools as well.